Interesting group of horses set to line up in the first, a $25,000 maiden claimer. Our top choice is #5 Rising Perry (7-2); the Ann Merryman trainee hasn’t made a huge impact in two career starts against better, last out in a race from which the runner-up, Marylander, returned to graduate next out. But there are plenty of other ways to go here if you’re so inclined. #1 Rhinestone Cowboy (5-2) makes his second career start here but first since July 2017; he was beaten a pole that day, but the winner was the (at the time) very promising Kowboy Karma, who won off by more than a dozen. Finding a more modest group here after the long layoff may be to his liking, as may the addition of Lasix. And though trainer Kieron Magee is just 2-for-32 with first-time starters, #7 Bond (9-2) is a half-brother to two $100,000 earners and enters off a bullet work. There’s a bit of early zip in this one-mile event, and that might be good news for the late-running #6 Arkadag (5-1). He crushed never-two competition two back but last out could only run evenly against better; that day’s runner-up, Global Citizen, returned to action after that with a win. Another horse who’s a little intriguing is #7 Zip Van Winkle (2-1), who’s coming out of an unusual race; he was up close early in extraordinarily slow fractions — 25 2/5 for the opening quarter, 50 2/5 for the half in a seven-furlong race — before they came home fast, with this one forced to settle for second. The favorite in this maiden special weight test is #8 Madding Crowd (2-1), who is winless in four career tries — all on the turf. Here she tries the main track for the first time, and we’re not fond of short odds on horses trying a surface for the first time. We’ll keep her on the ticket but look to beat her on top with #7 Appealing Honor (5-1), a daughter of Quality Road making her career debut here for trainer Louis Albertrani. She’s a half-sister to graded stakes winner Quantum Miss and to the multiple graded stakes-placed Tonasah, and five of her siblings won at age two. While this race is for three-year-olds, that record suggests a win-early pedigree. Katie Davis will ride. In six tries at this 5 1/2-furlong distance, #4 Field Advantage (7-2) has made five trips to the winner’s circle. He lands in the right spot here following a win against Penn National allowance foes and will look for a stalk-and-pounce trip under Sheldon Russell. The horse he figures to be stalking here is the favorite, #7 The Great Provider (2-1), who has been second in five of seven tries at the distance and arrives off a win against $10,000 company. 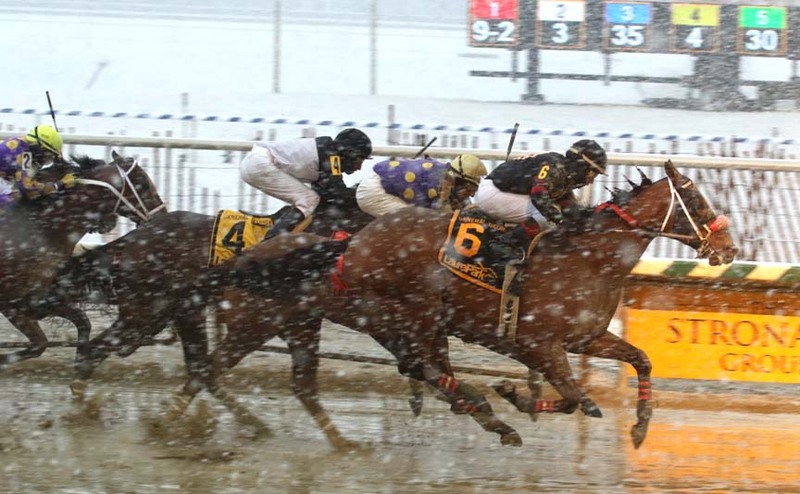 Trainer Graham Motion and West Point Thoroughbreds had higher hopes for #6 Still Dreaming (7-2) than to be running in Laurel Park allowance races in April of his three-year-old year. Following his maiden score here, they sent the Triple Crown-nominated half-brother to Kentucky Derby winner Nyquist to Tampa Bay Downs to run in the Grade 3 Sam F. Davis. That didn’t go so well, and a bout in the local Private Terms also didn’t bear fruit. But dropped into allowance company, he has a chance to get back on track against a more manageable group. The favorite in here is #4 Sunman (2-1), who rallied smartly last out for second against similar and may find the seven-furlong trip to his liking, but he’s lost at this level four straight. We’re partial to horses claimed back by their original trainers, particularly when those trainers are guys like Jeremiah Englehart, who plays the claiming game. Such is the case with our top choice in this one, #1 The Mason Factor (7-2). Englehart lost him three back in his maiden score and grabbed him back last out for a nickel. He ran a so-so fourth that day, but we wouldn’t judge that race too harshly; it was a strange affair in which Dark Ops ran off to an enormous lead before getting run down late. This race seems likely to play out a bit more normally, and Englehart will leg up go-to rider Jorge Vargas, Jr.
Last time out, #4 Stoney Bennett (7-2) was never much involved en route to a fifth-place finish in a second-level allowance at Laurel. But here, against similar, he’s stretching back out to a one-turn mile (from six furlongs) and projects to be the main speed in the group. If jockey Horacio Karamanos can get him out of the gate in good order and to the front, he may be tough to run down in here. Two others we like here are #5 Moonlight Shadow (8-1), a Rodney Jenkins trainee making his first start since last July but possessed of a sporty 3-for-4 ledger for a trainer who can get ’em ready to win off a long layoff, and #8 Colour Guard (6-1), whose last may have been better than it looks, as that race produced a next-out stakes winner and a next-out stakes-placed runner. And that’s to say nothing of the favorite in here, #3 Tattooed (3-1), who just missed against similar last out. A couple of runners who are logical contenders in this one — #6 My Chesa Charm (7-5) and #7 No More Excuses (2-1) — figure to want to be in the same place, which is on the lead. That might create a favorable scenario for our top choice, #2 Bad Nana (4-1), who ought to be able to sit back and watch the pace unfold for new trainer Jamie Ness. Trainer Jeremiah Englehart sends out the two top contenders in here in the form of favored #4 Hot Sriracha (6-5) and second-choice #6 Curlin’s Knight (9-5). The former has better speed figs and seemingly better credentials, but note that the latter gets Englehart’s go-to rider, Jorge Vargas, Jr. up.